Dealing with a flood cleanup for Las Vegas homeowners is a headache. If last night’s major storm has left you with a reminder of the power of Mother Nature, you may have quite a mess on your hands. Even the most basic knowledge and preparation will help you save yourself time and money, not to mention keeping yourself and your loved ones safe. ERX, the Emergency Restoration Professionals can help with your emergency flood cleanup. We are available 24/7. If you’re like everyone else the first question you will ask is where do I start? We hope this helps. 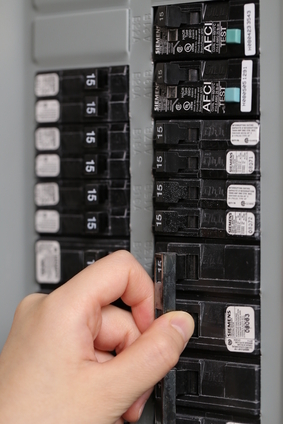 Provided your fuse box hasn’t been affected, kill the power down below. In some cases you may need to use something such as a mop handle to switch off the electricity. Don’t mess with AC current. Electricity and moisture is a recipe for disaster. Never enter a room with water above the level of the electric sockets- wait for the water to recede. Put on rubber boots before making contact with the water. And never touch an electrical appliance you have to step into water to reach. If in question, contact a licensed electrician. If your home or office is flooding that means the water is coming from somewhere. If your basement is flooding it oftentimes from the floor above your basement. This can cause the basement ceiling to sag. If the ceiling is sagging then use an ice pick to puncture holes in the floor and place pans under the drain-holes. A compromised ceiling is at risk of collapse, which could injure you if you’re in the room. If the cause of your flooding is plumbing, you will need to identify the source of the flooding and shut off the water. Before you can begin other repairs, you have to fix the source of the problem to be sure the flooding has stopped. During a natural disaster such as a flash flood, this is obviously not feasible and you have to focus on limiting damage. Make sure your clothing fits the task at hand. We suggest wearing an old long-sleeved shirt, waterproof boots and gloves, and a protective facemask. After a flood your home or office is a potential HAZMAT Zone. Bacteria, nasty germs, mildew and molds are likely present. You don’t want to inhale any of this. Even if you’re confident in your abilities to repair your home you should contact a professional. There are many other difficulties associated with flooding such as mold, bacteria, and residual odor, as well as possible structural damage and electrical problems. An ERX professional will have the expertise and experience to deal with all of these issues. If you have a flood your first concern should be safety. Be sure to exercise care around sagging ceilings and electrical appliances while the area is still flooded. Clear the area as much as possible, but let a professional take care of the rest. ERX can help you handle insurance concerns and restore your home to pre-flood conditions. ERX, your Emergency Restoration Experts, are available 24/7 to for your flood cleanup emergencies in the Las Vegas area.